There is a good chance that this will be the best Thursday night game we have seen all year — though that’s not saying much given the overwhelming slate of mid-week games we have been subjected to. The stakes are very high for both teams in this one. 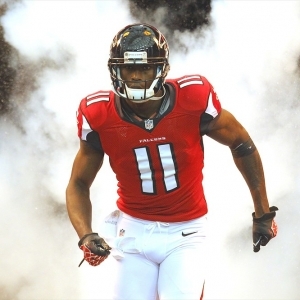 With a win the Falcons would climb to 11-1 on the year, and at that record they would have all but wrapped up their division. They will also maintain their strong lead in the race for home-field advantage throughout the NFC playoffs. The Falcons are all but certainly heading to the playoffs regardless, though, so the game is even more important for the Saints. At 5-6 they are not out of the wild card chase yet, but at 5-7 they would be in a very tough situation. A loss wouldn’t eliminate them from playoff contention, but it really wouldn’t help. While the Saints have been better recently than they were early in the season, it’s certainly possible that they could be guilty of looking beyond this game. It’s not that they won’t respect this Falcons. It’s just that they are in the midst of a brutal run of games. They lost to San Francisco this week, and this game is followed up with a trip to the Giants and then a tough home game against the Bucs. If this team isn’t mentally tough and focused they could be in real trouble starting on Thursday night. The Falcons have lost only once in 11 games. To add to the intrigue of this contest, though, that loss came on Nov. 11 — the last time these two teams met. The game was tight, but the Saints took the lead late in the first half and never gave it up again en route to the 31-27 win. Despite the loss, the Falcons had no issues passing the ball that day — Matt Ryan completed 34-of-52 passes (65.4 percent) for 411 yards with three touchdowns and one pick. The fact that the Falcons could throw at will isn’t surprising — the Saints have been lousy against the pass all year. What’s striking, though, is that Atlanta couldn’t run that day — they ran 18 times for just 46 yards. The Saints are dead last in the league in rushing yards allowed, so their ability to stop the Falcons that day is surprising — and a clear indication that the inability of the Falcons to run all year is a serious issue. The success of the Saints that day doesn’t come as a surprise if you are a believer in trends because New Orleans has dominated this series between divisional rivals. They have won four straight meetings and 11 of the last 13 games. The Saints have also covered the last four spreads, and they have done it as underdog in three of the games — and they are underdogs in this one. The Falcons had better hope that this game isn’t close because they certainly can’t rely on kicker Matt Bryant right now. Bryant missed a 22-yard chip shot at the end of the first half last week, and then missed again from 48 yards late in the second half. They still won 24-23 in regulation time, but the margin of victory certainly could have been more comfortable if Bryant had done his job. Bryant has already missed as many kicks this year as he did in the last two full seasons combined, so he’s definitely not on his game. Injuries are something of an issue for both teams as they are for most teams by this point in the season. One situation that you likely don’t need to be worried about, though, is star Atlanta receiver Julio Jones. Heading into last week’s game Jones’ ankle was a serious concern, but all he did despite the handicap was pile up 147 yards and score. Obviously, he wasn’t too hurt. Those health concerns haven’t been as much of an issue this week, and even if they were it would be hard to get too worked up about them given the performance last week. The game opened with the Falcons favored by 3.5 points. It dropped briefly to a field goal, but has since climbed back to 3.5 points. The Saints are pulling in a solid majority of the bets in this one, so the line isn’t likely to go any higher and could again fall to three points by kickoff. It’s unlikely to fall further than that, though. The total opened at 55.5 points, and has climbed slightly to 56. The underdog is 6-1 ATS in the last seven meetings between these squads. Seven of the last 10 meetings have gone “over” the total. The Saints have gone over the total in each of their last five games against NFC South foes. I’ve gone back and forth on this one in my mind. On one hand the Falcons are not nearly as good as their record suggests. Seven of their 10 wins have been by a touchdown or less, so they have been far from dominant. On the other hand, though, the Saints’ defense is very vulnerable, and the Falcons are reasonably confident offensively coming into this one. Most significantly, though, I have serious concerns about the mindset of the Saints. They have gone through a lot this year, and the cracks seem to be showing. I just don’t trust them — even less than I trust the Falcons. I lean towards the Falcons as a result, and I’d wait until as close to the game as I can in hopes that I only have to give up three points.